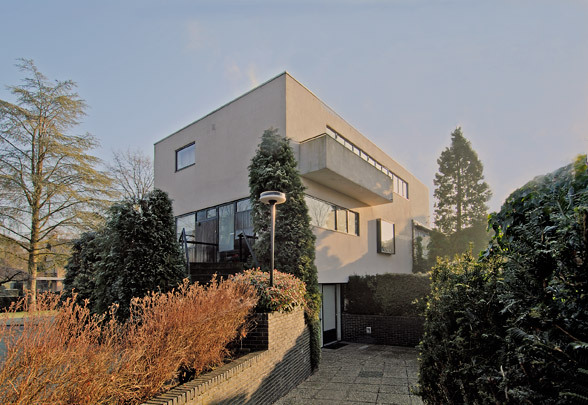 Long after having passed the age of retirement, Wijdeveld designed this functionalist-looking villa at the corner of two avenues. The house consists of a basement of garage and separately accessed dentist's surgery, a slightly raised ground floor containing the main entrance and living spaces, and an upstairs level of bedrooms. The basement is clad in green-glazed brick and set back slightly. The rectangular main volume is white rendered, its abstract air enhanced by the cruciform pattern formed by the front door, windows, stair window and an abstract concrete relief.